(Newser) – Talk about getting government—and courts—off our backs ... Rand Paul declared ObamaCare "unconstitutional" again tonight, despite what the Supreme Court has ruled. "When the Supreme Court upheld Obamacare, the first words out of my mouth were: I still think it is unconstitutional! The leftwing blogs were merciless. I still think it's unconstitutional!" 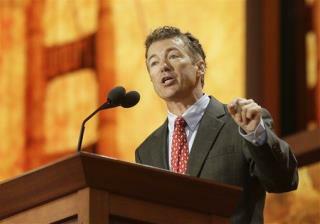 Paul declared at the Republican National Convention. What to do? Elect Mitt Romney, he urged: "How do we fix this travesty of justice? There’s only one option left. We have to have a new president!" In the Randian view (Ayn Rand not Rand Paul, or maybe...) Health is purview of the wealthy, keep the under class sick and they die off early placing less of a burden on the people who count. But if for political reasons (Now this is Randian as in Rand Paul) you must support health as universal at least make sure there are businesses profiting from the enterprise. Well had we been able to get a single payer system like most of the free world then "ORomeny Care" would be moot. but the insurance king pins wouldn't get there cut so we get this. As a person who knows first hand how hard it was to get insurance as an individual I am ok with "ORomeny Care"
Rand failed to mention he also believes Jim Crow laws have constitutional merits.